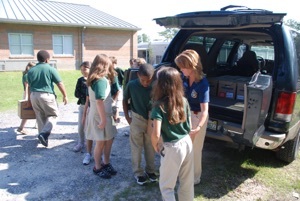 After studying about hurricanes and tracking several storms, including Hurricane Katrina, the students at Cypress Ridge Elementary School in Clermont, Florida decided they wanted to be able to make a difference for students in the affected area. Throughout the 2005-2006 school year, we, Mrs. Star Olson and Mrs. Kellyann Goring, guided our classes through a Service Learning Project to raise money to purchase new books for a teacher in Mississippi who lost her classroom to Hurricane Katrina. During the project, our students worked with classes of all grade levels throughout our school to create quilts pertaining to topics they were learning about in class. Our students created PowerPoint presentations to tell about the Quilts to Books project, and later presented to the Clermont City Council to educate our community on their efforts. Our students wrote and produced commercials to be aired on our CRES Morning News and took part in several newspaper interviews. We made the newspapers three times that year! 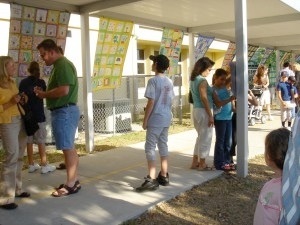 During the Cypress Ridge Elementary Celebration of Learning in May 2006, we displayed the 21 quilts created by the students. We raised $2,303 during the event. We took our money to Scholastic Book Warehouse where they matched our funds, allowing us to purchase $4,606 of new books. Students from our classes presented the project to other classes at our school. They even shared the project with the Clermont City Council. Many people from our community came to see our quilts. We raised $2,306 in must 2 hours. Through the help of Mrs. Robinson at the Service Learning Office, we were able to drive the 30 boxes of books (several boxes of books were donated to our project by teachers at our school) to Mrs. Poelma’s classroom at St. Martin Upper Elementary School in Ocean Springs, Mississippi. 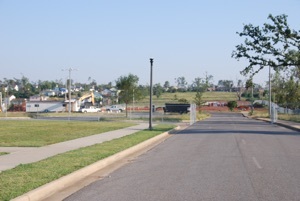 While in Mississippi, we toured the affected area, noticing little reconstruction had occurred. 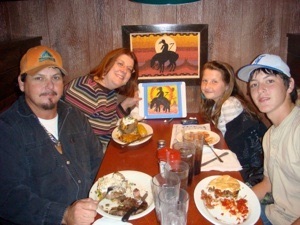 We decided to continue our efforts during the 2006-2007 school year. 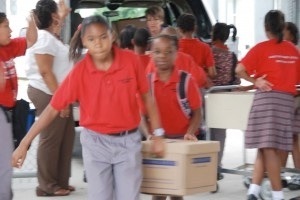 That year, we expanded our project to include the students of St. Martin Upper Elementary. Our students produced a video that was sent to Mississippi, along with quilt squares. This video explained our project, why we are doing this project, and a way these students can participate. We asked the children affected by Katrina to create quilt squares telling their story of the time surrounding the hurricane. These quilt squares were then sent back to us to be quilted and placed on display around the Clermont area and the Cypress Ridge Elementary School Celebration of Learning in May to help raise awareness and to tell these children’s story. Throughout the year, our students again presented their project to participating classes at our school, created PowerPoint projects to explain our project, spoke to the Clermont City Council, wrote letters to the Mississippi children, and created commercials to be aired on our morning announcements. We made the newspaper 4 times in Florida and once in Mississippi. Some just couldn’t wait to dig in. During the Cypress Ridge Elementary Celebration of Learning that year, we displayed 36 quilts created by our students and 10 quilts created by the students in Mississippi. Every student in our school (640) participated in the project this year and 260 Mississippi students participated. We raised $2700 from the quilts created by the CRES students which was enough to purchase 13 boxes of new books purchased at the Scholastic 50% off sale. The students created a video to tell others about our project. Dennis remembered us from the year before. 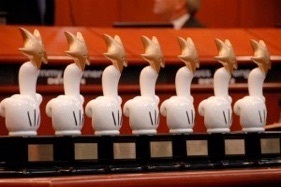 In addition to these great accomplishments, Walt Disney World recognized our project by awarding us the top Teacherrific Award in November 2006. Once again, thanks to the support and efforts of Mrs. Robinson at the Lake County Service Learning Office, we were able to personally deliver these books, along with a special gift, to the students and teachers at St. Martin Upper Elementary School in Ocean Springs, Mississippi. 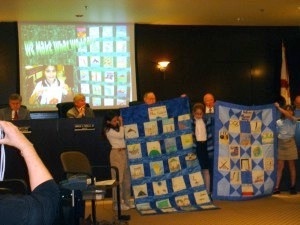 The quilts created by the Mississippi students were returned to the St. Martin Upper Elementary School as a gift from us. We felt these quilts belonged to them and were an important part of their healing process as well as a valuable piece of their community history. St. Martin Teacher Admiring one of their quilts. St. Martin’s Terry Poelma offers to help us raise money to benefit a teacher in New Orleans. 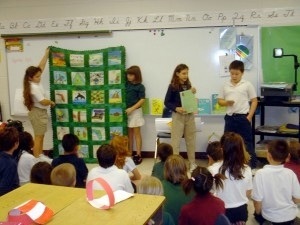 During the 2007-2008 school year, St. Martin Upper Elementary School conducted the Quilts to Books project in conjunction with Cypress Ridge Elementary. We supplied these teachers with all the necessary materials to complete the project, including sewing their squares into quilts for them. We then returned their quilts to them so they could conduct their fundraiser at their curriculum night as Cypress Ridge does. We then collectively purchased books for Sarah T. Reed Elementary School in New Orleans, Louisiana. Again, Mrs. Olson and Mrs. Goring traveled, along with Mrs. Poelma and Mrs. Rutland of St. Martin Upper Elementary, to Louisiana, delivering more than $7,000 of books to 4th grade teacher, Miss Jill Dresser, at Sarah T. Reed Elementary. 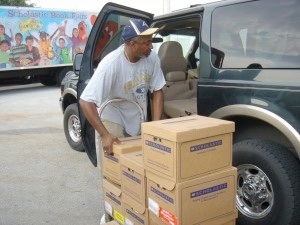 At this point in time, we have been able to deliver $17,000 of books to the Gulf Coast Region. But we can’t stop here! The Quilts to Books Project continued in its 4th year during the 2008-2009 school year as Star Olson, now a 5th grade teacher at Cypress Ridge Elementary School, and Kellyann Goring, Lake County Innovative Learning Specialist, continued to work in conjunction with Terry Poelma and Katrina Rutland, 4th grade teachers at St. Martin Upper Elementary School, to raise funds to purchase books for the Langston Hughes Academy in New Orleans, Louisiana. Again, our students, and the students at St. Martin will continued to implement their reading, writing, and problem solving skills, along with technology skills to make presentations to other classes at school, telling about our project and explaining how to make the quilts which will be used to generate the funds. We again presented our project to the Clermont City Council and the South Lake Community to help raise awareness for our project and the current condition of the Gulf Coast States schools. All 34 Cypress Ridge created quilts were on display at the CRES Celebration of Learning May 14, 2009. The St. Martin quilts were also be on display before being returned to Mississippi for their curriculum night. All money raised that evening, along with the money raised by the St. Martin quilts in Ocean Springs, was brought to Scholastic Book Warehouse where we purchase new books from 50% to 80% off the retail price. In addition to the support we receive from Scholastic Book Warehouse, Sam’s Wholesale Club in Ocoee, Florida showed their support for our project this year by matching our donations, up to $2,000. This money was also brought to Scholastic Book Warehouse, allowing us to purchase up to an additional $4,000 of books. It takes many hours to purchase this many books. The “Scholars” at Langston Hughes Elementary were eager to carry their new books back to their classroom. Mrs. Olson, Mrs. Goring, and Mrs. Poelma traveled once again to New Orleans in order to deliver the books to Mr. Justin Lamb, 4th grade teacher at Langston Hughes Academy. We spent a day at Langston Hughes Academy, meeting “scholars” and talking with teachers and administrators. We shared videos and stories from our students. The students at LHA then participated in making a video for the CRES/SMUE students. Later that evening, we took Mr. Lamb, and several students out for dinner. This gave us the opportunity to learn more about the students and their lives since the hurricane. RESULTS FROM 4TH YEAR: Total of $25,000 of books have been delivered in total between the efforts of CRES and SMUE… And we are NOT DONE YET!! 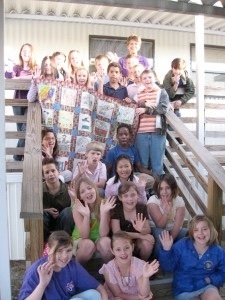 During the 5th year, 2009-2010 school year, Mrs. Olson and Mrs. Goring continued to work with the students at Cypress Ridge Elementary with the Quilts to Books Service Learning Project. Our unit plan remains the same as in year past. We are excited, however, to announce we now have 4 schools participating in raising funds with us. 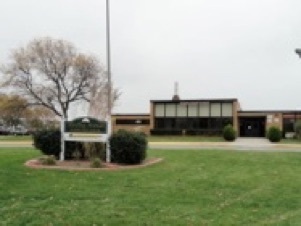 In addition to St. Martin Upper Elementary, which has participated in the past 2 years, we now have Rimes Elementary in Lake County participating, under the leadership of Dr. Cantwell, as well as Langston Hughes Academy, the recipient school of our books the previous year. This time we located a teacher at Arabi Elementary who was in great need of a classroom library, as this was the first year the school had reopened its doors since the hurricane in 2005. Ms. Thompson’s students had been in contact with our students at Cypress Ridge Elementary so when we arrived in September, 2010, they were already familiar with each other. We delivered a total of nearly $10,000 of books. This brings our total dollar amount of books purchased and delivered directly to the teachers to nearly $32,000. During the 2010-2011 school year, our 6th year of the Quilts to Books project, we set our sights on Slidell, Louisiana as we created nearly 60 quilts spanning 5 schools across Lake County, and of course, St. Martin Upper Elementary School in Ocean Sprints, Mississippi. 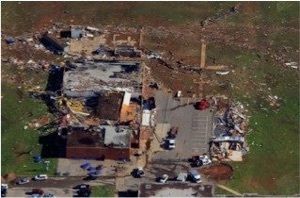 Due to recent tornado damage in the Tuscaloosa, Alabama area, we decided to take a side trip to survey the damage. We brought several hundred books to a teacher at Holt Elementary while we were there. We had the exclusive opportunity to tour the neighborhoods of both Holt Elementary and Alberta Elementary. This is a place we would like to return in the future. At the conclusion our 6th year of the Quilts to Books Service Learning Project we are proud to say our total dollars of purchased books has reached $36,000 of books to the Gulf Coast Region as we visited classrooms at Abney Elementary in Slidell, Louisiana. 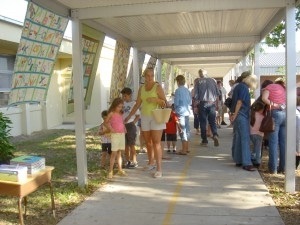 Our 7th year, the 2011-2012 school year had once again been a huge year for quilt making. Cypress Ridge created 36 quilts for the Celebration of Learning. Unfortunately, due to limited funds, we were not able to travel this year to bring books to a teacher in Alabama. Instead, the books purchased will be added to the books we will purchase next school year. This brings us to the 2012-2013 school year where we have once again carried out the Quilts to Books project with our students at Cypress Ridge Elementary School for the 8th year in a row. We created 30 quilts and raised $1700. 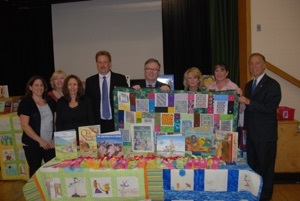 This, coupled with last year’s funds has provided a nice size library to be given to several teachers at Harding Avenue Elementary School in Lindenhurst Elementary, an area of New York affected by Super Storm Sandy in October of 2012. This makes a total of nearly $42,000 of new books purchased and delivered to teachers recovering from natural disasters. Mrs. Thompson is overwhelmed with the amount of books we brought her. As we entered our 9th year of the Quilts to Books project during the 2013-2014 school year, we encountered a few exciting developments. Mrs. Goring had made the decision to return to the classroom, allowing her to then carry out the project once again with her own classroom. This also brought in a new school to our project. Cypress Ridge created 38 quilts while Astatula created an additional 4. Together the two schools raised just over $3,200 to be used to purchase new books for Ms. Goodman’s classroom at Briarwood Elementary School in Moore, Oklahoma. We continued our Quilts to Books Service Learning Project for the 10th year during the 2014-2015 school year. 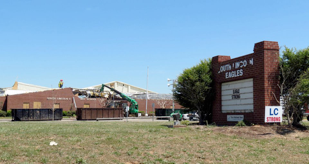 Once again, Cypress Ridge Elementary and Astatula Elementary worked together to raise money to purchase new books for Mrs. Simmon’s 2nd Grade class and Ms. Gibson’s 4th Grade class at South Lincoln Elementary in Fayetteville, Tennessee which was leveled by an F4 tornado April 2014. Together, Cypress Ridge and Astatula raised just over $3,800 with the 42 quilts on display at the Celebration of Learning and the Spring Musical. We continued our Quilts to Books Service Learning Project for the 11th year during the 2015-2016 school year. Once again, Cypress Ridge Elementary and Astatula Elementary worked together to raise money to purchase new books. We brought a new library to a 2nd and 4th grade classroom at Minnie Ruffin Elementary School in Monroe, Louisiana. 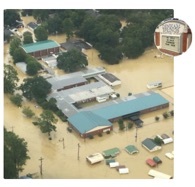 This school was recently flooded due to excessive rainfall causing their town levee to break. 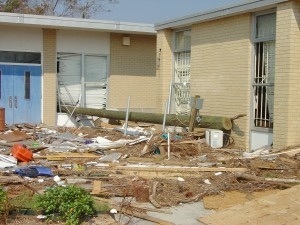 Several classroom libraries, including their main school library were ruined due to the rising water. We had a total of 44 quilts this year and raised over $3,500. For the 12th year of Quilts to Books, during the 2016-20167 school year. Once again, Cypress Ridge Elementary and Astatula Elementary worked together to raise money to purchase new books. During the2017-2018 School year, Quilts to Books celebrates its 13th year of success. This year, Cypress Ridge Elementary will be raising money to purchase new books for a 4th grade teacher at Lucian Adams Elementary in Port Arthur, Texas. 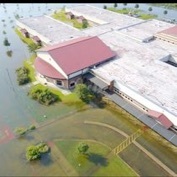 This school was flooded by Hurricane Harvey this past August.